Bringing all of Nick Jr's most beloved characters to the big stage, Nick Jr. Live! 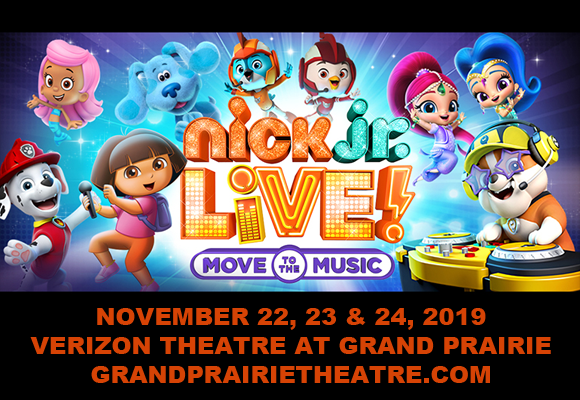 Move to the Music comes to Verizon Theatre at Grand Prairie on Friday 22nd November 2019! With interactive song and dance numbers that will thrill and delight your little ones, Move to the Music presents members of Bubble Guppies, PAW Patrol, Dora the Explorer, Shimmer and Shine, Blue's Clues & You!, Blaze and the Monster Machines and Top Wing in a fun and lively show that they'll simply adore!